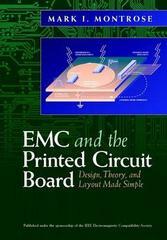 Mark I. Montrose, the best-selling author of PRINTED CIRCUIT BOARD DESIGN TECHNIQUES FOR EMC COMPLIANCE, now brings you his newest book, EMC AND THE PRINTED CIRCUIT BOARD. This accessible, new reference work shows you how and why RF energy is created within a printed circuit board and the manner in which propagation occurs. With lucid explanations, this book enables engineers to grasp both the fundamentals of EMC theory and the mitigation process needed to prevent an EMC event.